Water aspirators were once a staple in many biology and chemistry labs but are becoming an increasingly uncommon sight as they are being replaced with vacuum pump aspirators. Water aspirators are designed to connect to a lab faucet and allow water to flow through a tube inside of the aspirator, thereby creating a vacuum. While this type of aspirator is inexpensive and has done a decent job for a very long time, you may want to think about upgrading to a vacuum pump aspirator. Why? Let’s take a close look at the environmental impact, performance, and lifetime cost of a water aspirator as compared to a vacuum pump. A water aspirator works when water from the tap is forced at a high velocity through a small nozzle. At the smallest part of the nozzle, a vacuum is created. A tube attaches to this portion and the vacuum draws fluid up through that tube. The fluid then mixes with the high velocity water flow and both discharge at the nozzle exit. This means that whatever is being aspirated is also being put into the sink drains and eventually our groundwater, and these can sometimes be volatile substances. Also, the water needed to run a single water aspirator is 2 gallons per minute. Moderate use at this rate is equal to approximately 50,000 gallons of water per year, per aspirator. Vacuum pumps, on the other hand, completely avoid the issues associated with water usage, as no water is required to operate the pump. Importantly, any biohazardous material can be discarded of properly in a much safer manner. The performance of the water aspirator is reliant upon water pressure and temperature which can cause an inconsistent vacuum pressure. Water aspirators are capable of producing a moderate vacuum, in some cases reaching as low as 10 torr. However, water pressure and temperature can fluctuate widely depending on how many people are using the system and how long the water has been running. Vacuum aspirators provide greater control with consistent and stronger vacuum pressure, leading to improvements in key lab applications. Where water aspirators fail to provide a deep enough vacuum for certain uses, vacuum pumps deliver. A simple dry lab pump can reach about 1 torr, which is certainly strong enough to handle most lab applications. Because the vacuum pump doesn’t require water, there are no environmental changes, such as water temperature changes, which will affect the way the pump operates. Water aspirators tend to be fairly inexpensive and don’t require much maintenance, but the true cost is the cost of long-term ownership. The vast amounts of water necessary to operate an aspirator can become expensive over time and if hazardous waste is disposed of improperly, the cost to clean that waste can be excruciatingly high. Additionally, if the sink drain clogs during use, it could cause damage to the plumbing or even flooding in the laboratory which would, of course, create a whole host of problems. While purchasing a vacuum pump may initially cost more than a simple water aspirator, the reliability, flexibility, and environmental impact of a vacuum pump are more cost effective in the long-term. At Next Day Science, we strive to help you continue to make cost-effective and worthy decisions regarding the purchasing of equipment for your laboratory. 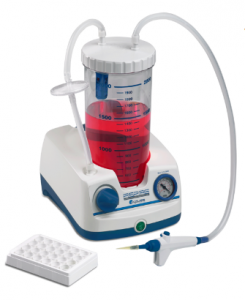 Next Day Science's line of up-to-date laboratory aspirators are an ideal choice for a wide range of laboratory aspirating applications, including removal of media from tissue culture vessels or plates and supernatants. Laboratory aspirators are a safe, reliable, and economical way to eliminate liquid waste and pathogens, no matter how hazardous. If you should choose to replace your water aspirator, we have a variety of vacuum pumps that are available and are quite affordable. In addition, you can also search Next Day Science’s website to find and purchase necessary accessories for different aspirators. For more detailed information, read the individual product descriptions, or contact one of our technical specialists to help you be sure you purchase the right equipment for your lab. Why is it important to use serological pipettes in a medical laboratory? What are cell culture plates?